Circle of Blue’s director and senior editor are on assignment in China. Here is a preview of their reporting to come next month. 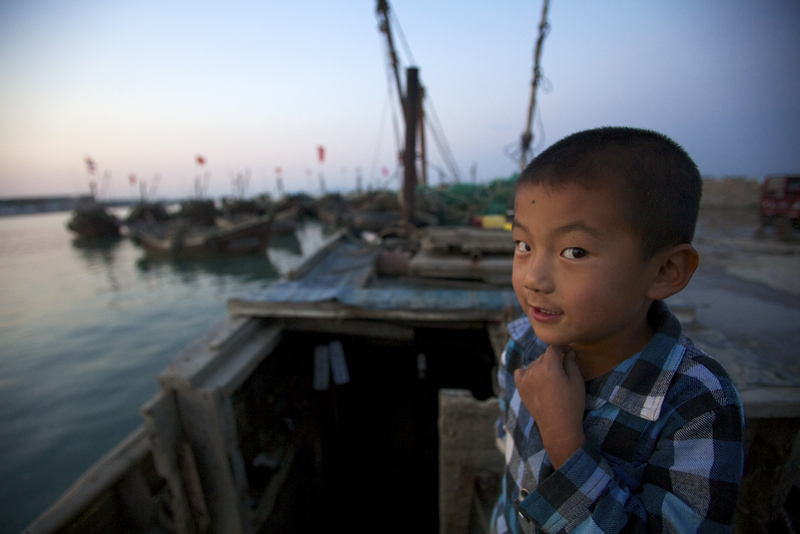 In Aoshawei Bay, submerged platforms support thick netting that grows scallops, clams, oysters, and mussels. Click image to enlarge slideshow. 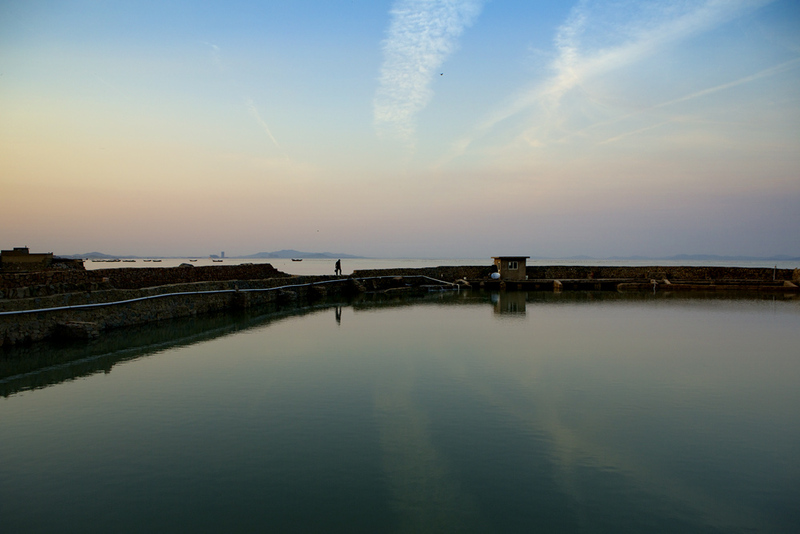 QINGDAO, China — At dawn the surface of Aoshawei Bay is a grid of black spots, line after line, straight as the rays of the rising sun, from one shoreline to the other. The spots are buoys that support the submerged platforms and thick netting that grow scallops, clams, oysters, and mussels and enclose immense mats of edible kelp. 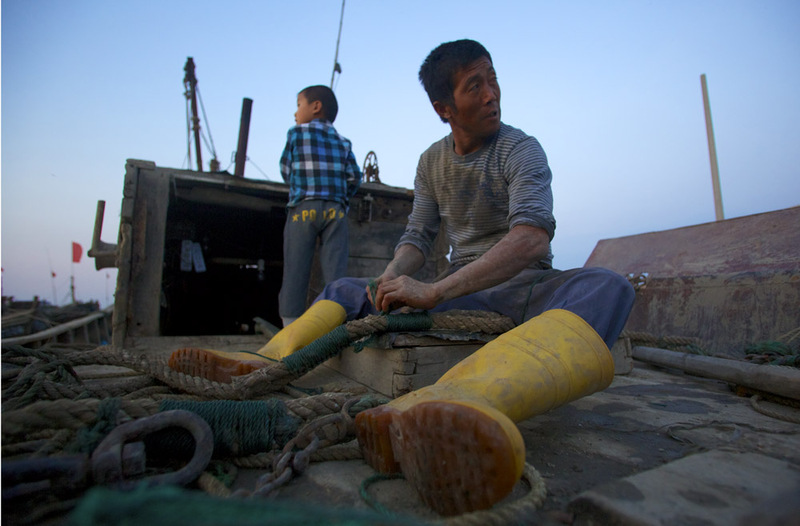 The buoys, tended by fishermen in wooden boats that have become gray and weathered by decades of use, are the most visible features of an aquatic food factory that employs thousands and feeds millions in Shandong, a province of 96 million people. And as my colleague J. Carl Ganter and I learned during an eye-opening interview with Yi Zhou, one of China’s top marine ecologists, Aoshawei Bay is an especially productive pearl in a string of clean Pacific coast bays that form the tidal infrastructure for Shandong Province’s marine aquaculture industry, the largest producer of farmed shellfish on Earth. Yi Zhou explained this to us in a second-floor conference room overlooking one of Qingdao’s broad sand beaches in the lovely late afternoon light. Carl, a photographer and co-founder of Circle of Blue, has been to China 10 times. This is my sixth trip in less than two years. Both of us are accustomed to China’s off-the-chart scale and dimension in almost everything. 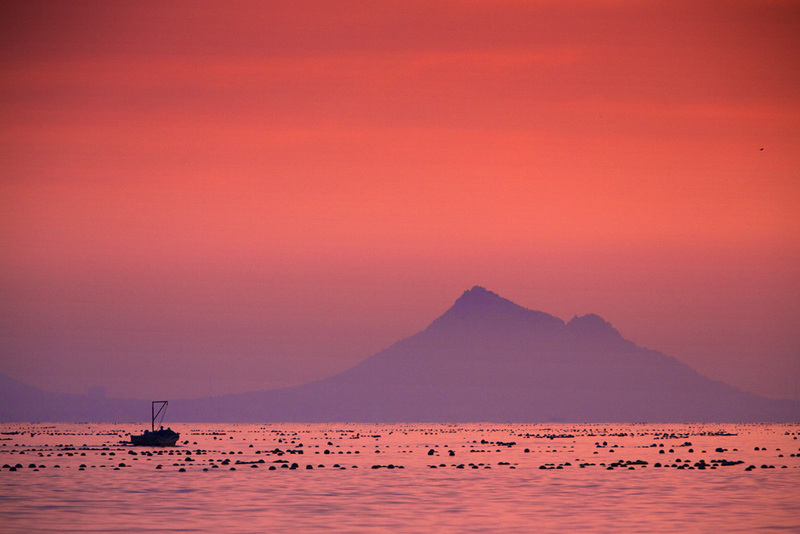 So 10 million tons of shellfish produced in nearby coastal waters, including this city’s own Laoshan Bay, wasn’t surprising — what came next was. “Is it safe to eat?” I asked. 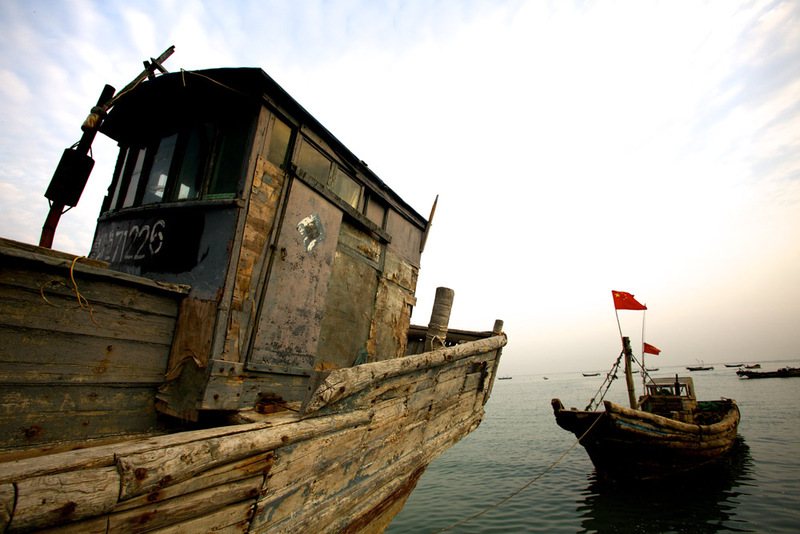 On a still Aoshawei Bay, lines of marine shellfish buoys stretch from shore to shore. Click image to enlarge slideshow. 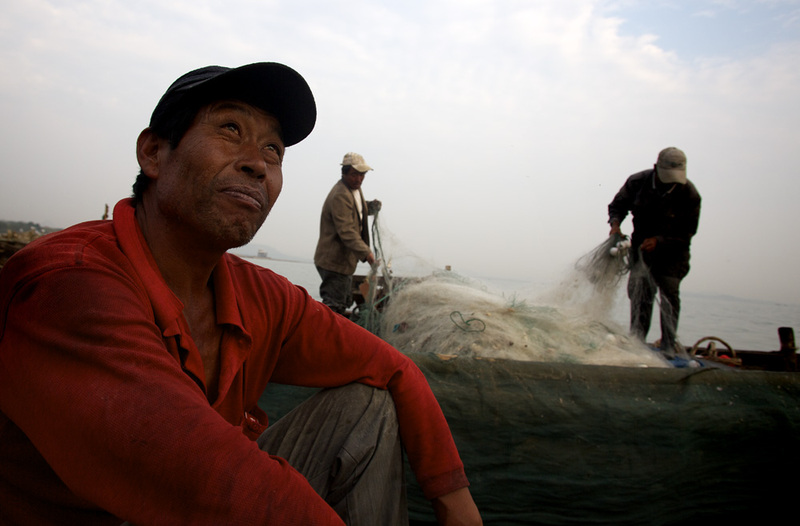 During the next 45 minutes, Yi Zhou calmly responded to a fusillade of questions and explained the gathered facts — largely confirmed by science journals and other Qingdao environmental professors — about production practices that have helped make Shandong’s marine aquaculture industry an apparent model of local food production that is ecologically sustainable and safe. The province is rich in tidal bays that fill with cold water, fortified with the sort of micro-nutrients favored by shellfish. The bays also empty, in effect transporting and distributing marine wastes that the resident shellfish filter as part of their natural feeding. Those wastes also provide nutrients to the enormous floating edible kelp beds that are raised alongside the shellfish — it’s like planting marigolds alongside cucumbers in an organic garden. 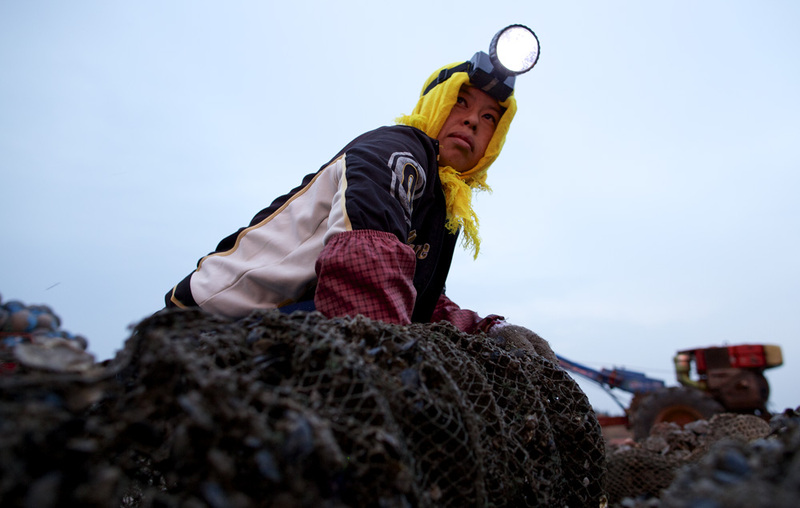 China’s appetite for shellfish is growing, and so is the world’s. 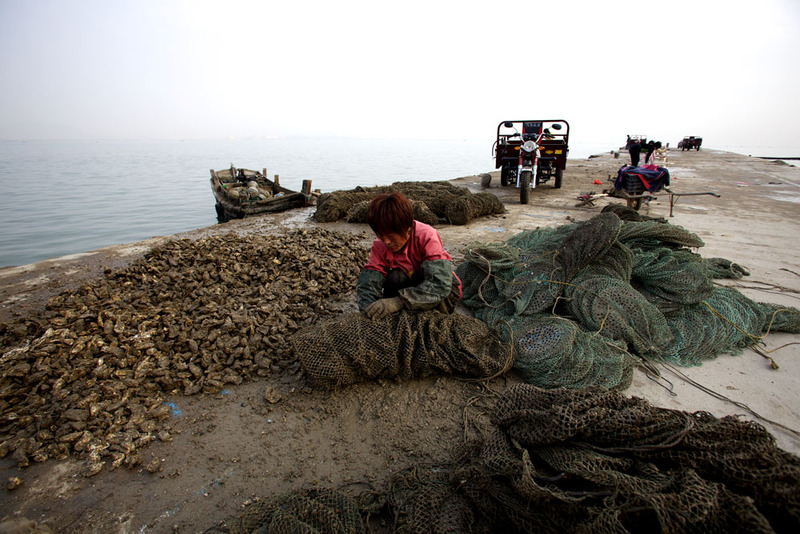 Shandong is now an important shellfish exporter, which keeps prices high and helps fishermen to earn good livings. Production has increased 3 percent a year since 2000, Yi Zhou said. 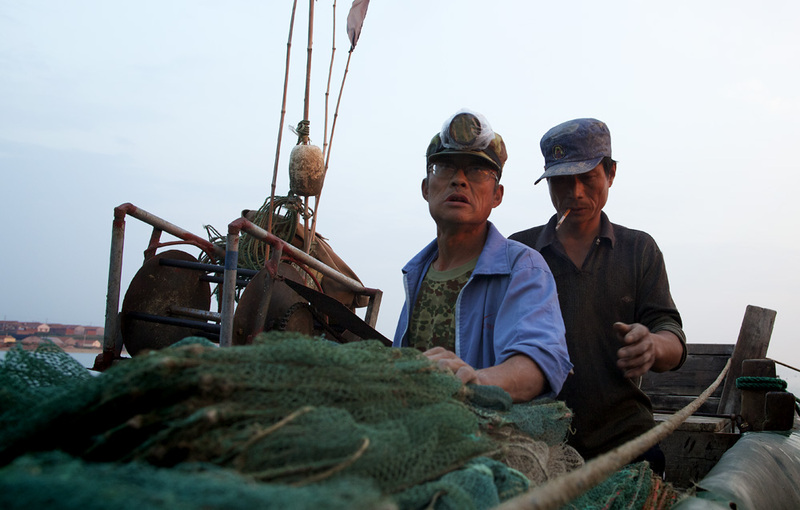 Chinese marine production techniques emphasize intense aquaculture density, but Yi Zhou assured us that they do not challenge the ecological capacity of the coastal bays. The waters north of here in Sanggou Bay, for instance, are so packed with shellfish and kelp beds that, from the air, it looks like a patterned blanket has been thrown over every square kilometer of the surface. But oxygen levels are high and water quality is very good, Yi Zhou said. 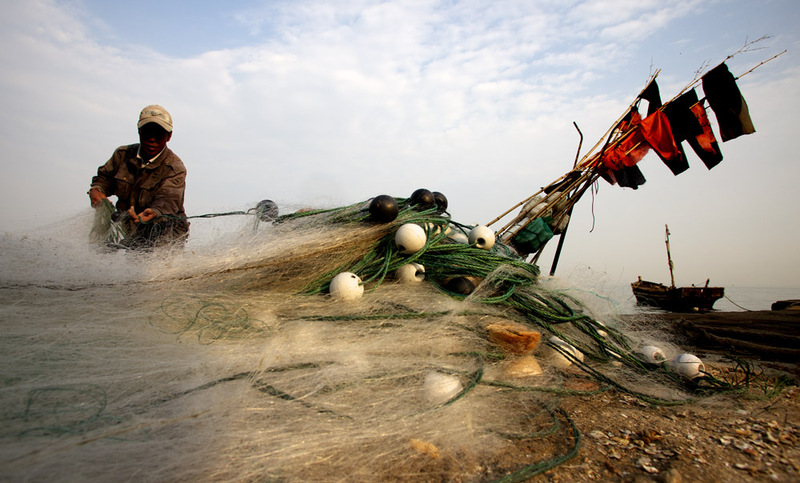 Untreated municipal sewage and industrial wastes are not being drained into coastal bays, in large part thanks to the big marine agriculture sectors in Shandong’s coastal cities. Qingdao, for instance, has made a big investment in sewage-treatment plants and has spent the last decade closing many of its old steel, metal-plating, and chemical factories, all among the worst industrial polluters. Each one of these points, needless to say, conflicted with everything I thought that I knew about Chinese aquaculture. I’ve since learned more. 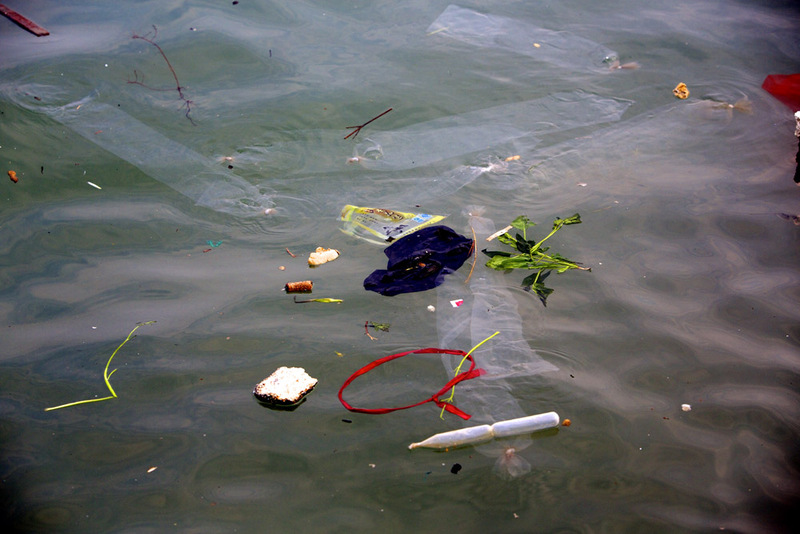 Trash in the waters of Aoshawei Bay. My poor impression of Chinese aquaculture was prompted by news articles over the years about tainted meal fed to fish, applications of antibiotics and other drugs, and exposure to untreated wastewater in the production of fresh and marine fin fish — bass, catfish, eel, and other species. In 2007, the U.S. Food and Drug Administration issued a food safety advisory about imports of Chinese fin fish after FDA tests showed the presence of elevated levels of antibiotics (used to battle diseases associated with living in such close quarters) that are outlawed in the United States. 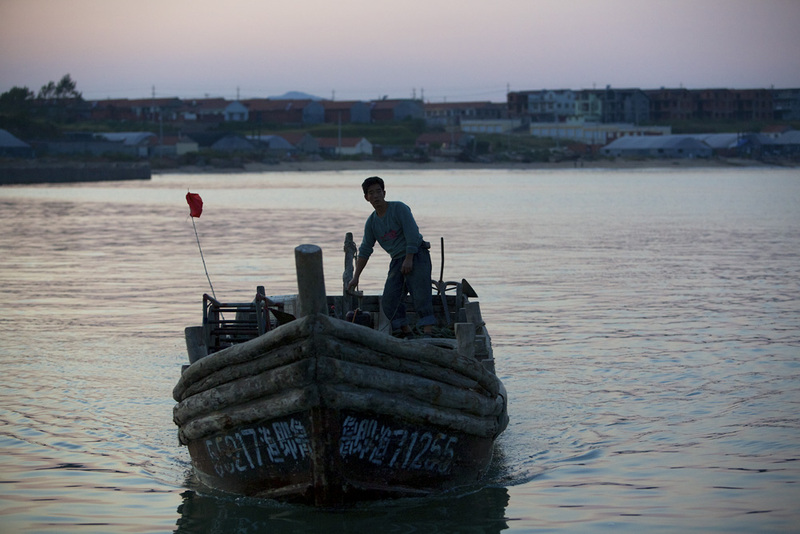 Chinese authorities also have focused on fin fish and shrimp farms as sources of serious water contamination. A 2010 study found that production techniques along the Bohai Sea, well to the north of here, that involve raising shrimp in huge indoor facilities produced 162.7 million cubic meters (43 billion gallons) of raw, untreated wastewater annually. The study found that the filthy water was discharged directly into the sea. Yi Zhou asserted in our interview that the marine shellfish industry has not been plagued by similar drug use or water contamination. 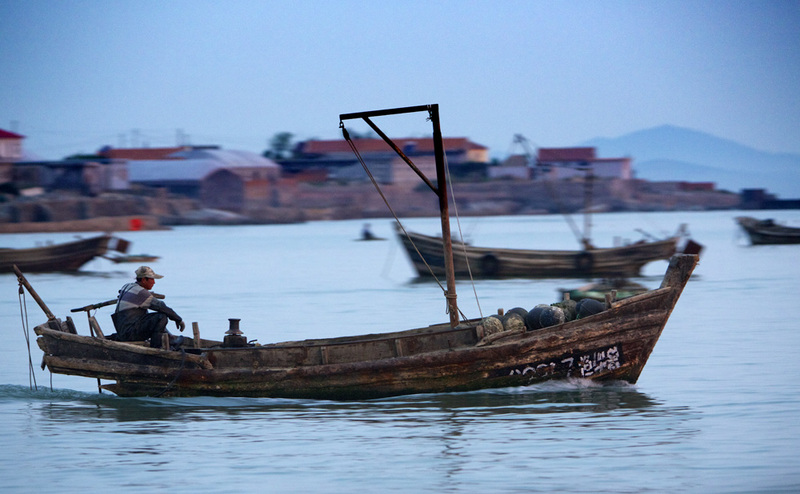 The waters of the Shandong bays where shellfish are produced are clean. Shellfish gain their food from the tides; they are not fed. And fishermen don’t use antibiotics or any other drugs to raise them. In fact, he said, raising his eyebrows, clams and scallops and snails absorb carbon dioxide to make their shells — so, it could be argued that the marine shellfish industry is helping to reduce atmospheric concentrations of climate-changing gases. 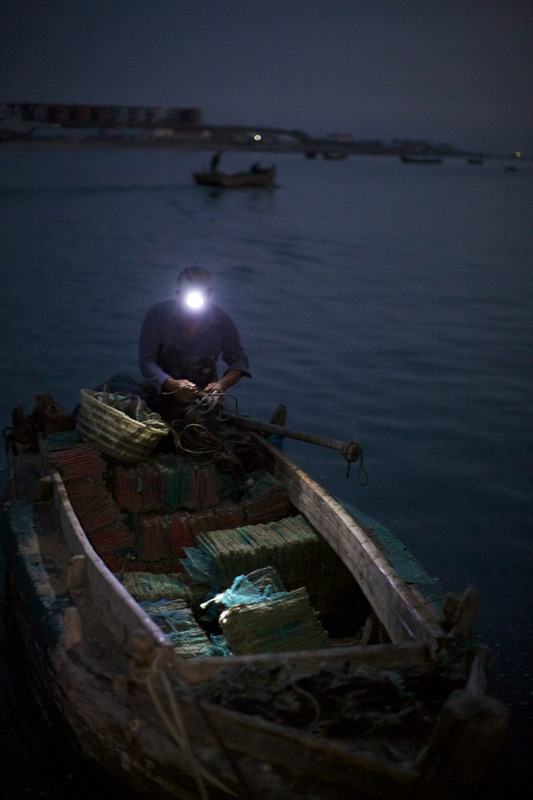 The pier was alive with fishermen attending to their boats and mending lines, their headlamps shining focused beams as they emptied nets and sorted oysters and scallops. 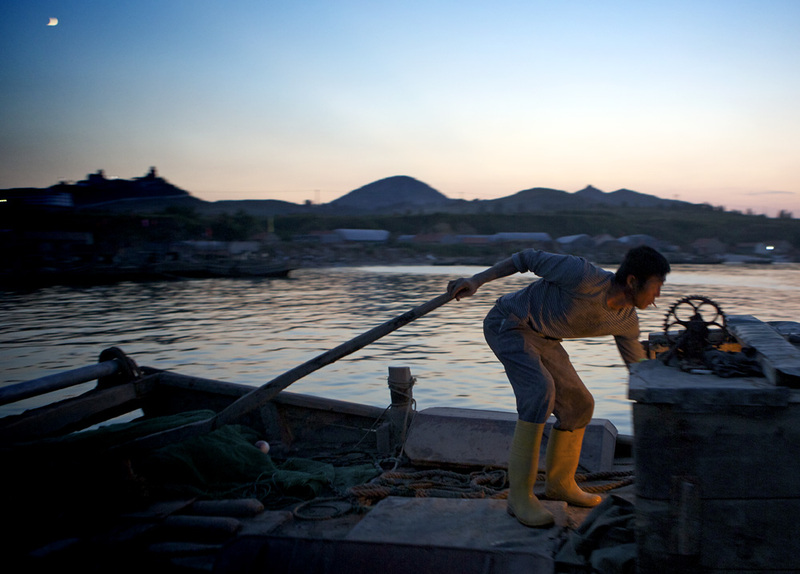 Last week Carl spent a night in Aoshawei Bay, waking before dawn to photograph fishermen beginning the day. He found an enterprise that encompasses the entire shoreline. He noticed big concrete buildings that hold tanks used for growing sea cucumber larvae. When the larvae are mature, they are transferred to expansive outdoor pools — made of cement, cut stone, and boulders — that fill and empty with the tides. Carl walked on the walls of the pools, wide enough also to serve as a resting place for the big guard dog on a chain that snarled an unmistakable warning not to draw any closer. The pier was alive with fishermen attending to their boats and mending lines. 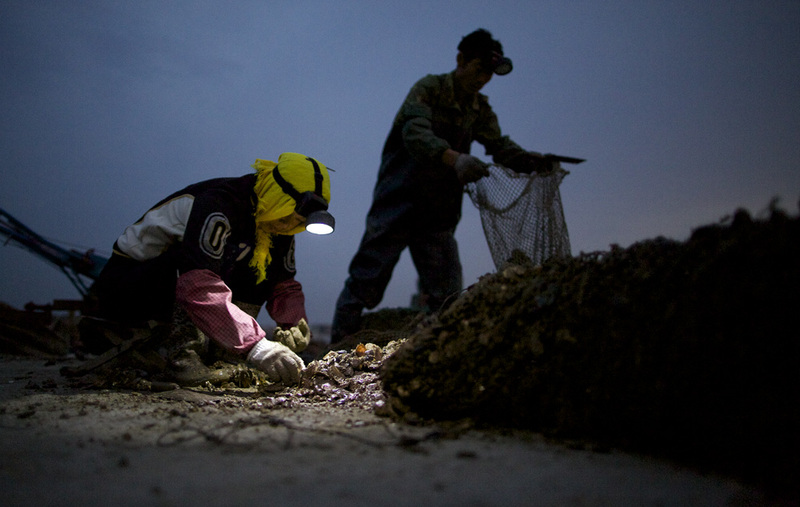 Women wore rubber boots and raincoats; their headlamps shining focused beams as they emptied nets and sorted oysters and scallops. The wooden mallets used to knock shellfish from the nets and the thud of shells hitting the stone-and-concrete pier was like a seaside percussion section, rhythmic and insistent. Around 5:15, the sun rose on a still ocean. Small engines, sputtering, fired to life. The scent of fish and crabs was everywhere. And so were the black buoys, visible in the rising light. Too many, Carl said. Way too many to count. Stay tuned, as next month we unveil Part II of our Choke Point: China series, in collaboration with the China Environment Forum at The Wilson Center. I think your idea is phenomenal! I’ve vorteuenled a couple times at Growing Power and see this as the future of farming. It’s brilliant! If you get a facility going in the Men. Vally in the future I’d be willing to volunteer, or even work there someday. I have a couple dozen Koi fish in my backyard and plan on routing the water through a raised bed this summer to grow watercress. I also heard of something in Bay View that was in the planning stage for raising fish. Do you know more about it?